Ecovillas is pleased to present you this luxurious villas in natural stone, restored and expanded, with all the modern comforts. These stone house are located at the edge of hamlet of a 6-7 house near the town of Vodnjan (Pula), while the beach of Fazana and the National Park Of Brijuni archipelago are just 8 km away. The accommodation consists of two houses (Villa Lavanda and Villa Mendola) connec ted by a fresh and spacious arcade (50 sqm), ideal for the hottest day of total relaxation, soothed by the summer breeze and the soothing chirping of cicadas. These stone houses are arranged on two floors and offer comfortable and spacious bedrooms equipped with their own private bathroom. Both the double beds are king-size bed and the decor is very nice, with different settings for each specific room and specially made. On the ground floor there is the cozy living area with large sofas, which lies on the porch and the pool made of green stone from Bali. 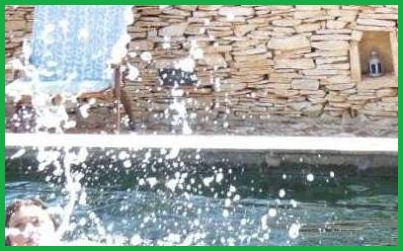 One side of the pool has a overflowing cascade and gives a pleasent and relaxing background to the environment. The pool is private. Villa Lavanda has 2 rooms with 2 double beds. Villa Mendola has 1 room with a double bed and one single bed, 1 room with double bed and 1 room with 2 large single bed. Two sofa bed are also available in the living room. All the double bed are king size beds. Both these stone houses are built in traditional Istrian style with a combination of stone wall and wooden ceilings and beams, all the interiors and the bathrooms are luxurious and beautifully furnished. All the bedrooms, apart one in the small house, have air conditioning, that works also for winter heating. Villas are only 20 minutes drive from Pula International Airport.